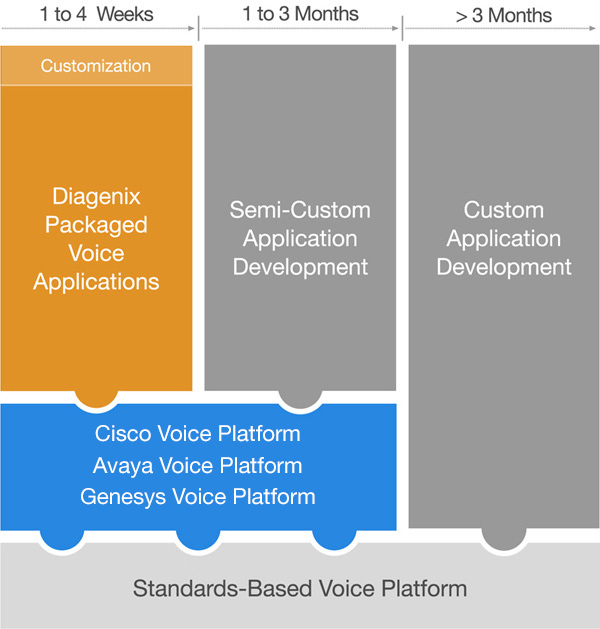 Having trouble finding a packaged voice application that does exactly what you need? 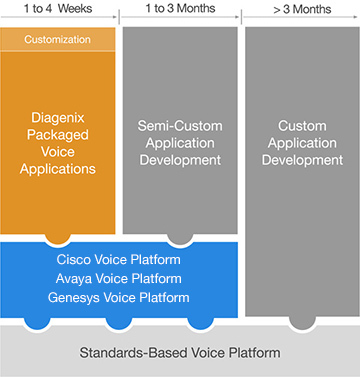 If so, let Diagenix help you build a completely customized voice application in less time—and for less money—than you could develop in-house. We couple a highly skilled staff of engineers with years of experience to rapidly produce high-quality, full-featured IVR and speech applications in a fraction of the time of competing approaches. Our custom applications are not stripped-down, one-off solutions that require countless hours of custom programming to implement. We produce robust, feature-rich applications that include advanced functionality such as integrated logging & reporting, configurable transfer gates, voice or DTMF operation, flexible user interface modules, and much more. Our goal is to get your application up and running in the shortest time possible-without requiring an open-ended commitment to ongoing consulting. Diagenix provides a distinct advantage over competing service providers with the way we approach the custom development process. Our process starts with a thorough evaluation of the project requirements so that an assessment can be made about how much new functionality needs to be developed and how much is already on-the-shelf in our extensive application library. Once complete, we offer one or more development options ranging from a fully-custom application to a semi-custom packaged application solution. Each approach has different time and cost advantages. The bottom line is that you can be sure to get a solution that is ideally suited to your requirements. Getting your voice project off and running is simplified with the guidance of a dedicated project manager and professional staff with years of experience. We will help you every step of the way to ensure we fully understand your voice application requirements and caller needs. Once your custom voice application is up and running we will pro-actively monitor and provide usability feedback to ensure you are getting the most out of it. Tuning services are also available to even further improve the caller experience and overall retention rates.